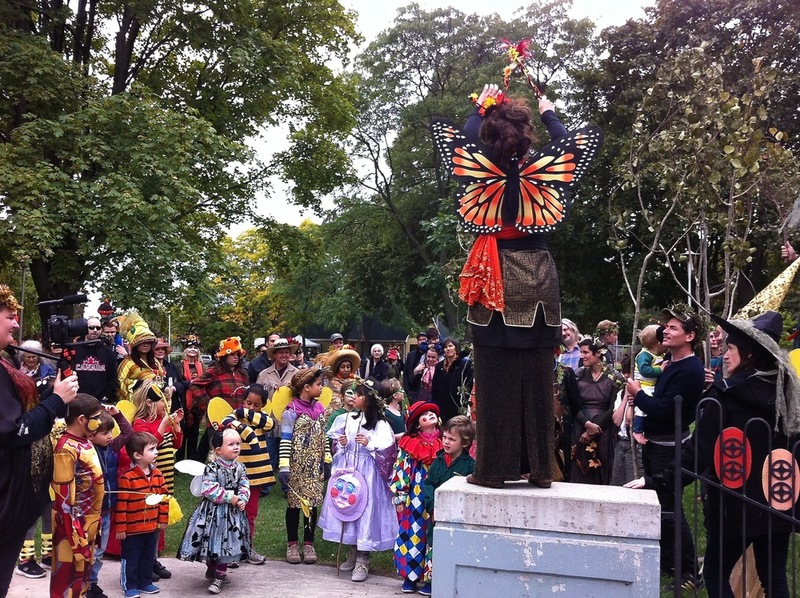 Botanicus Art Ensemble produces theatrical celebrations and festivals throughout the year to mark the passing of the seasons, Winter Solstice, Planting, Harvest and Water Festivals as well as special occasions such as Canada Day. 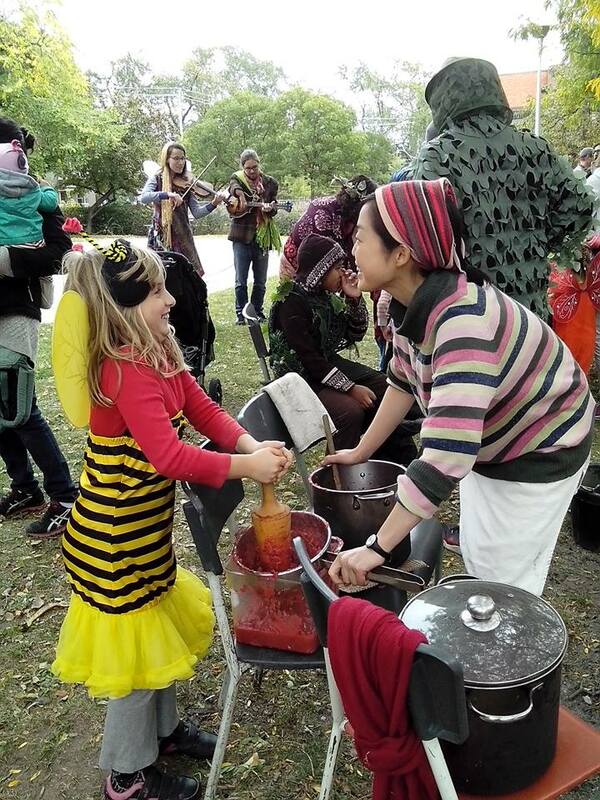 If you would like to be a volunteer for Botanicus Art Ensemble events, festivals or workshops we would love to hear from you! 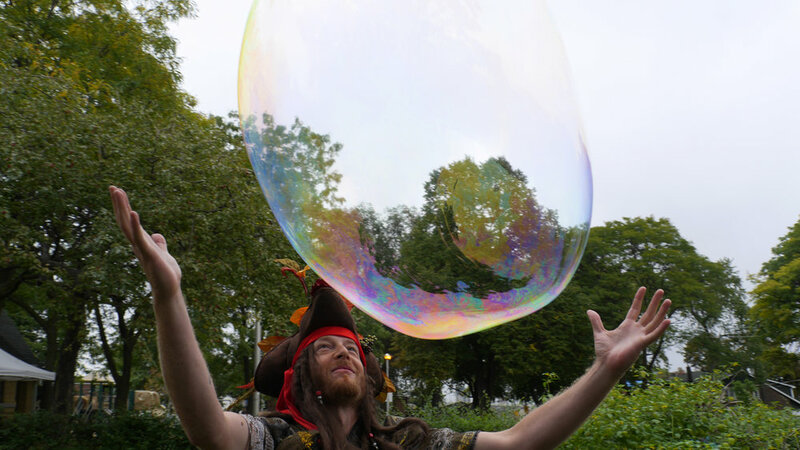 If you have a passion for live entertainment, performance, costume making, sewing, storytelling, stage design, arts administration, social media, poster and banner design, dance, circus arts, acrobatics, singing, storytelling and last but not least giant bubble making we have many volunteer positions available for Fall 2018. Botanicus is temporarily migrating north to a new location, Campbell Park. 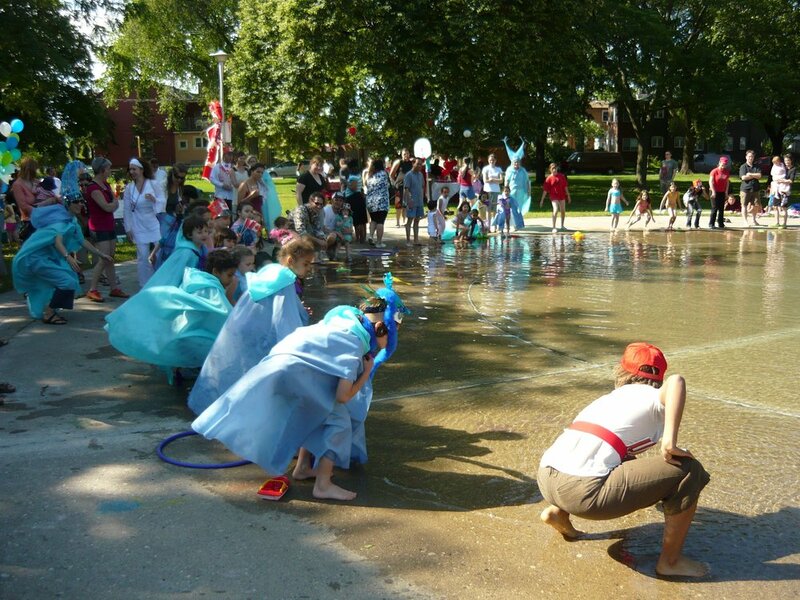 Botanicus Art Ensemble will be hosting CHoChoAkiNika Players,the fluid group of Artiistscurrently working on the Eel Project—they are Luc-Anne Salm, Benjamin Ramirez and ArifJinha from Ottawa. Come and learn songs and dances, we can help youcreate your own costume and become a creature of the ocean or rivers, learn to swim like an eel and help operate puppets big and small as we prepare for our Celebration. The project is a celebration of the American Eel, but you may ask, who is this slippery character? Well here are some Eel facts that may surprise you. The American Eel plays an important role in Canada's aquatic biodiversity. Our Hydro Electric dams have prevented them from reaching their feeding grounds, and have reduced the amount of good habitat for them to live in the river. American eels are the only species of freshwater eel found in North America. They live along the Atlantic coastline from Venezuela to Greenland and Iceland. Eels can also be found in the Great Lakes and Mississippi River. Eels have a complex lifecycle that begins far offshore in the Sargasso Sea where adults spawn. After eggs hatch, young eels drift inland with ocean currents into streams, rivers and lakes for over 3,700 miles. This journey may take many years. Young eels stay in freshwater until they reach maturity, between 10 to 25 years, before migrating back to the Sargasso Sea. 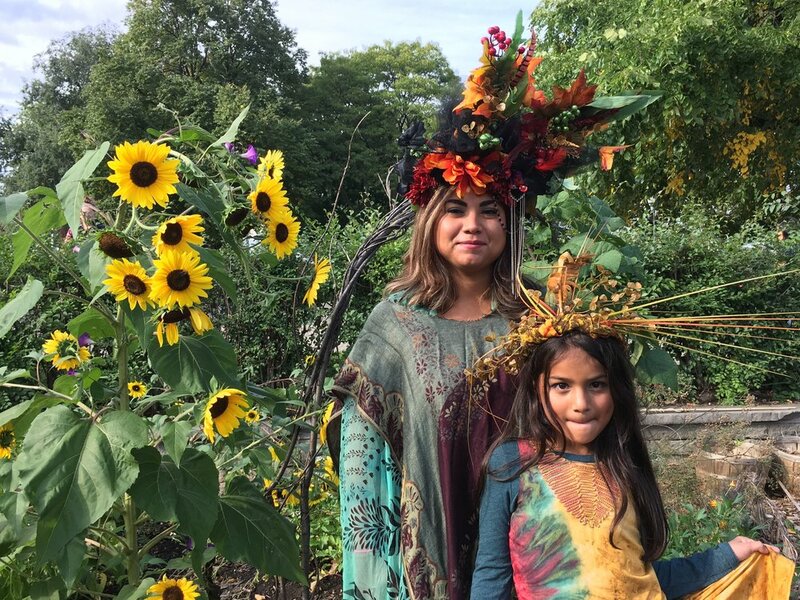 All the bumblebees made in art workshops in the MacGregor Teaching Gardens turned out for a "Bumblebee Flash Mob" hosted by Polly and the Pollinators: Director Kit Tough with special guest performance Aline Morales. Throughout the spring, we hold music, theatre, and storytelling workshops alongside weekly drop-in gardening sessions. 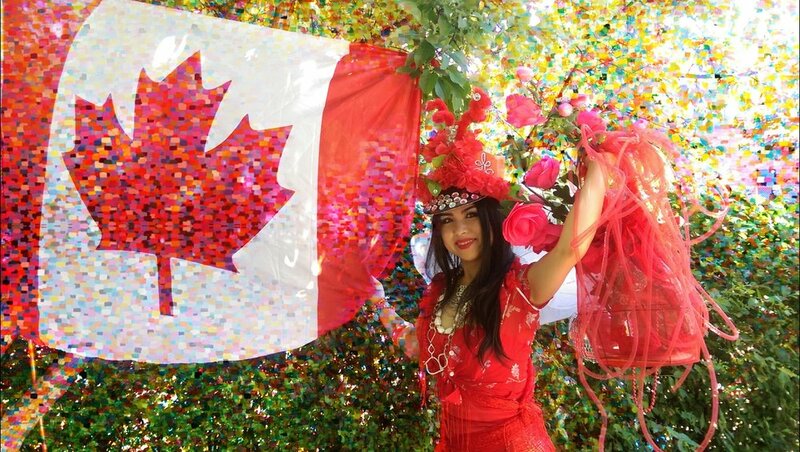 Community members help develop characters, songs, and costume designs that blossom into a magical theatrical performance in the park on Canada Day. We had a lot to celebrate in 2015. The MacGregor Park teaching Gardens was designed, constructed, and is now flourishing. 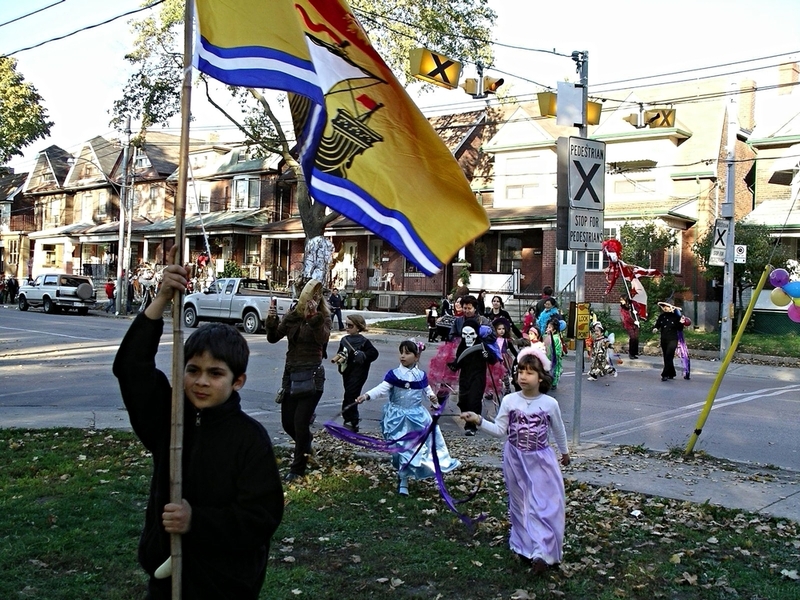 To commemorate the passing of such an abundant year, Kristen and Kit worked together with Lorraine, Ruth, and a whole host of volunteers to create the Harvest Festival Parade - a wild, interactive processional event that brought out the whole community in collaborative celebration. Lorraine and Ruth Maltese wrapped the actors in fantastical costumes made of leaves, buds, flowers, twigs and multicoloured fabrics. And Kristen Fahrig, our brave organizer, wove the participants and audience together into a fuzzy electric blanket that kept us all warm. Lucky for us, Katie Nicholson was around to capture the whole thing on film. Kit Tough, leading the processional as her true winged self – Monarchia –penned an immersive storyline that incorporated characters made up by the participants.